Thanks to their distinctive smoky flavor, canned chipotle peppers really bring this recipe to life, but they can be a little intimidating if you haven’t worked with them before. Most recipes call for a very small amount (for good reason! ), which means you end up with an almost full can when you finish. To get around this, remove the peppers from the can and pour all of the flavorful liquid into a food processor. If you don’t have one, use a small glass bowl. Cut the peppers in half and scrape out and discard the seeds. The seeds pack a lot of heat, so keep some of them if you like extra spice. Place the peppers in your food processor and pulse them until a paste is formed. If you don’t have a food processor, finely mince the peppers with a knife and add them to the bowl of reserved liquid. Stir to combine thoroughly. Next, line a large plate with plastic wrap and scoop the pepper paste in 1 teaspoon measurements onto the plate, leaving enough space between them that they don’t run together. Place the plate in the freezer to harden. Once set, wrap the edges of the plastic wrap around the now-firm pepper paste portions and place in a freezer-safe bag and freeze. Pull out 1 or 2 teaspoon-sized portions and use in your favorite chili or other recipe that calls for a little heat. Start small with the amount of chipotle peppers you use! You can always add more if you like a little more heat. 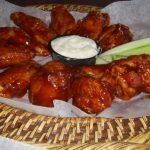 Sweet and Spicy Chicken Wings – Thanks to their distinctive smoky flavor, canned chipotle peppers really bring this recipe to life. – Chicken Wings, Salt, Black Pepper, Butter, Chili Garlic Sauce (Fresh and Finely Minced), Ginger (Fresh and Finely Minced), Chipotle Peppers (Canned), Honey, Soy Sauce, Rice Wine Vinegar, Preheat oven to 425 degrees. ; Line a rimmed baking sheet with parchment paper or spray with nonstick cooking spray. ; Add chicken wings to baking sheet in a single layer, not touching or overcrowding. ; Season wings with salt and pepper, then place in oven. Bake until skin is crisp, approximately 45 – 50 minutes. ; About 20 minutes before the wings are done, add garlic and butter to a saucepan and heat over medium heat until garlic becomes translucent. ; Reduce heat to low and add ginger, chipotle peppers, honey, soy sauce and vinegar. ; Reduce heat to low and simmer for about 15 minutes, until the liquid becomes syrupy. ; Transfer the sauce to a glass bowl and add the cooked wings. ; Toss until coated and either serve immediately, or place on a rimmed baking sheet lined with parchment paper (or sprayed with non-stick cooking spray) and place under broiler for a couple minutes, until brown and bubbly. ; Serve with celery and carrots and ranch dressing. ; – Be sure you have plenty of heat-quenching drinks ready! Season wings with salt and pepper, then place in oven. Bake until skin is crisp, approximately 45 - 50 minutes. Reduce heat to low and add ginger, chipotle peppers, honey, soy sauce and vinegar. Reduce heat to low and simmer for about 15 minutes, until the liquid becomes syrupy. Toss until coated and either serve immediately, or place on a rimmed baking sheet lined with parchment paper (or sprayed with non-stick cooking spray) and place under broiler for a couple minutes, until brown and bubbly. Be sure you have plenty of heat-quenching drinks ready!